A baby's birth is cause for celebration and at Beatrice Community Hospital and Health Center, births are celebrated with a variety of "extra" touches that help families welcome their infants into the world. Our Maternity Unit is located on the south end of the hospital, on the west side of our Patient Wing. This private unit includes two Labor/Delivery/Recovery rooms with whirlpool baths, two post-partum rooms, two labor rooms, one swing room and one observation room. Our staff of RNs and LPNs care for mothers and babies during labor and delivery as well as providing nursery services, The staff has access to two pediatricians, a physician assistant and a nurse practitioner who are available 24 hours a day. Our Maternity Unit delivers 200 babies annually and works in collaboration with our two obstetricians, midwife and family doctors. Our Maternity Unit offers a caring and progressive environment to new mothers and families. Our services include: a central monitoring system, hearing screen testing, infant security system, birth and family preparation classes and breastfeeding support. After your baby is born, a lullaby is played on our overhead paging system so that the entire hospital can celebrate in your joy as well! Combining the newest technologies with modern design is our way of making sure advanced care is always there for you and your family. It's a special moment when moms and dads see their baby for the first time in the mother's womb. Ultrasound uses sound waves to safely and painlessly gather detailed information on how your baby is developing. Mothers who have their ultrasounds performed at Beatrice Community Hospital receive a complimentary CD with photos of their baby's images. The arrival of each baby is "musically" announced throughout Beatrice Community Hospital with several measures of Brahms' Lullaby, and always brings smiles to eveyone in the hospital. 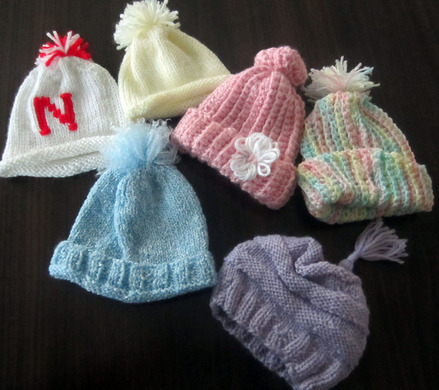 Each infant receives a handmade cap, lovingly made by volunteers in the community. Each cap is unique and becomes a treasured family keepsake. Infant photos are taken by Maternity and Nursery staff prior to discharge. these photos are avilable on Mom 365. The nurses love doing this and use an abundance of creativity with the photo shoots to achieve your special memory. The Hugs security system keeps your baby safe while in Beatrice Community Hospital. A bracelet is placed on the infant's ankle after birth. The system monitors the baby's location so hospital staff can transport your infant, but will send an alarm throughout the hospital if taken off the unit by someone other than hospital staff. 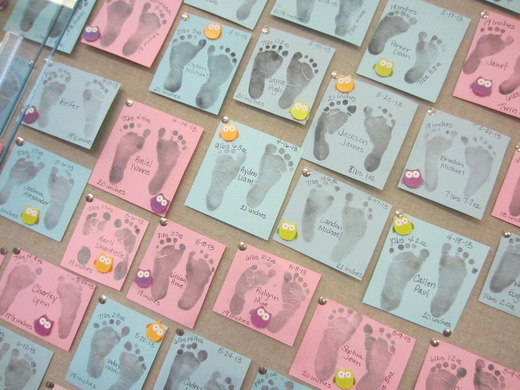 The footprints of each baby are posted on a Bulletin Board, announcing the first name and weight of every boy and girl.